View of the entrance to the Billar Mexicano billiards parlor near 113 East 4th Street, on the south side of the street between Kansas Avenue and Quincy, in Topeka, Kansas. 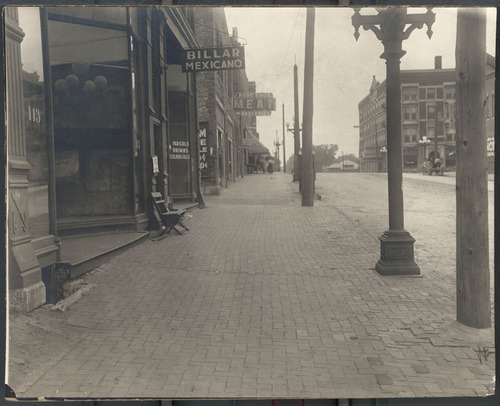 Also visible along the city street are buildings and businesses, including the Rabe Brothers grocery, pedestrians, a horse-drawn wagon, utility poles and power lines, streetcar tracks, globed streetlights, a wide bricked sidewalk, and a bench placed near the Billar Mexicano entrance. See image #210568 for a view of the same location taken looking in the opposite direction.